We keep cardboard food packaging to use for crafting. It becomes the frame work for duct tape purses, new boxes, covers and backs for mini-notebooks and all sorts of other things. I like these a lot too. Glittered ornaments for our tree. What you'll need is templates or craft punches a small hole punch, all but the heart I used a 1/8 inch punch on, glitter, we used Martha Stewart's because I have lots of it I bought on sale after the holidays last year,glue and some sort of spray sealer. 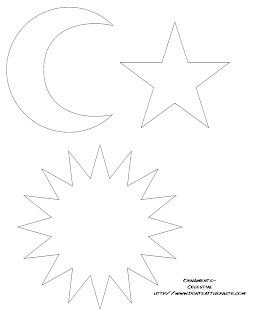 If you use my templates, print them out on paper, then cut them out. Trace the shapes on to your cardboard and cut out the cardboard. 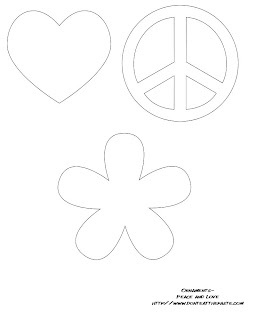 A craft knife is helpful for the peace symbol, but if you work carefully you can use scissors. 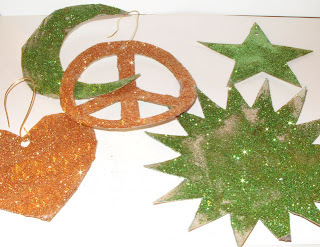 Punch a small hole near the top, and cover the shapes with glue and sprinkle glitter on them. Let dry. Seal. If you want them to come out very nice and neat looking, you could spray paint the shapes before spreading the glue and glitter on them, but I like the way these look without it. We put the glitter on the plain brown side. You can actually decorate these all sorts of ways. I offered my daughter buttons and sequins as well. She did the green ones.She also wanted me to point out the shapes make nice negative stencils to decorate clothing with. Click on the templates for the full sized version. Aww, pretty! Thanks so much for the templates, I'll be linking. ok we loved these SO much I went out TONIGHT to our local bookstore to buy glitter (they know us as a crazy homeschool family...) the LOOKS i got going up the street shoutiong "dont close yet we need glitter"....fun , thanks for he great project !